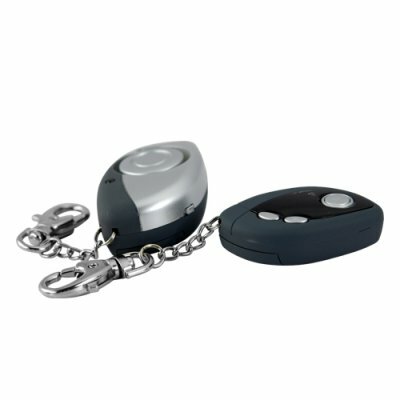 Successfully Added Wireless Guardian - Anti Theft Alarm Set to your Shopping Cart. Keep your valuables safe with this anti theft wireless alarm key chain. Anti-theft and anti-loss wireless alarm for traveler's luggage and for people walking around in busy streets. This wireless set comes with both a transmitter that you can attach to your luggage or purse as well as a wireless receiver. If you travel often and have to carry your laptop bag, which also might contain currency and your passport, then this is the perfect item for you. Get the peace of mind you deserve in your journeys, without having to always be paranoid or on the look out. This wireless guardian comes with 3 selectable modes each unique in providing strict security measures to ensure your belongings are safe from pick pockets and thief's roaming the shopping malls and town centers. First Mode will make the receiver beep if the wireless transmitter is more than 5-10 meters away from each other. Vibration mode, when the wireless transmitter is shaken, then the transmitter will alarm and the receiver will beep. Magnetic Mode, this mode works by using the magnet and the wireless transmitter together and attache them to your bags zipper, and when someone tries to tamper with the zipper, the transmitter will alarm and the receiver will beep. Never lose your purse or backpack, thanks to this genius anit-theft alarm set. This item makes a great gift for the whole family and if you are into making money, this is also a prime time product to feature on your own internet storefront. The CVECG-J21 is proudly brought to you by the leaders in factory direct wholesale consumer electronics, Chinavasion. Attach to backpacks, purses, etc. Anti-Lost/ Pick Pocket Mode: Any Time Wireless Transmitter is 3~5 Meters from Wireless Receiver, Receiver will Beep. Very loud bi bi bi bi noise, alerts everyone around you. This unit operates on very little power so the batteries should last a good while, but it is good practice to always check the battery just encase your battery is running low.